Disney's Oscar-nominated short film features the Emerson String Quartet's rendition of Borodin's String Quartet No.2: Third Movement: Nottorno (Andante). 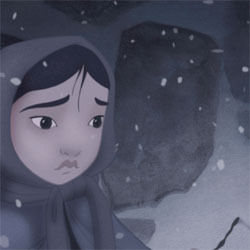 Based on the tale by Hans Christian Andersen, The Little Match Girl is the heartbreaking story of a young girl struggling to survive as a street vendor in 18th-century Europe. The Little Match Girl is included as a bonus feature on the 2-disc DVD release of Disney's The Little Mermaid.